The art of Arabian sitting in an Islamic style decoration adds a sense of luxury to the house decorations because this style was often used in ruling castles and Islamic states. Until today, the Andalusian palaces and ottoman mosques display the splendor and uniqueness of this style which varies from one area to another depending on the previous civilization. This kind of this style features Islamic motifs, the art of the mosaic, and the inscriptions of the Arabic calligraphy. It also uses the polestar art, pottery, woodcraft, and metals such as ivory, marbles etc. Such type of designs requires a large ornate elegant area to offer comfort to a large number of guests and visitors. Basically, the Arabian sitting decor focuses on the creativity in engineering design and the elements and pieces used for furnishing and its size. It also depends on handmade pieces because it adds a sense of authenticity and Meticulousness. The beauty of this style is very eye-catching due to the pillows and carpets that shows the attention given to details and the mastery of the Islamic art along with the inscriptions and decorations that you find in the ceiling and walls. The ceilings and walls of the Arabian sitting are decorated in an elegant style. 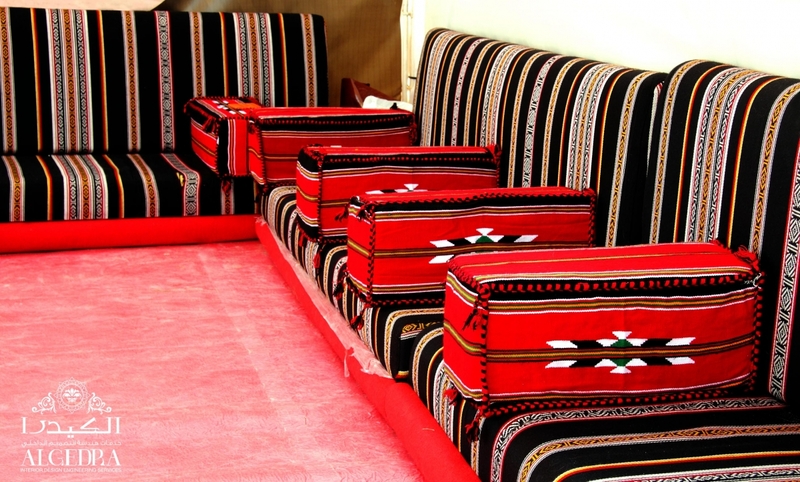 The carpet designs give a unique aura, shows the unity in style, and showcases the smooth appearance in order to increase the luxury in the Arabian sitting. The velvety curtains or curtains made of other luxurious fabrics are often added to give the Arabian sitting decoration a deep sense of luxury and Excellency. The colors of the Arabian sitting are inspired by the geographic nature of the Arabian countries where there are the sun and some warmth. Arabian sitting have harmonious colors and also some refreshing colors such as the blue and green. Some luxury colors such as purple, red gold, and silver are also added in order to reinforce the modern Islamic look in the style. Adding a few decoration plants and flowers makes you feel as if you are in an Oasis. The decoration plant pots are very important to be added in an Arabian sitting area, but they must match the decorations, furniture, and designs that are already done. The mosaic is one of the most beautiful elements of the Arabian sitting’s décor. Adding the Mosaic Pattern in the wall decorations, ceilings, or anywhere around in the form of frames can give a unique sense of the Arab Islamic style to the house. 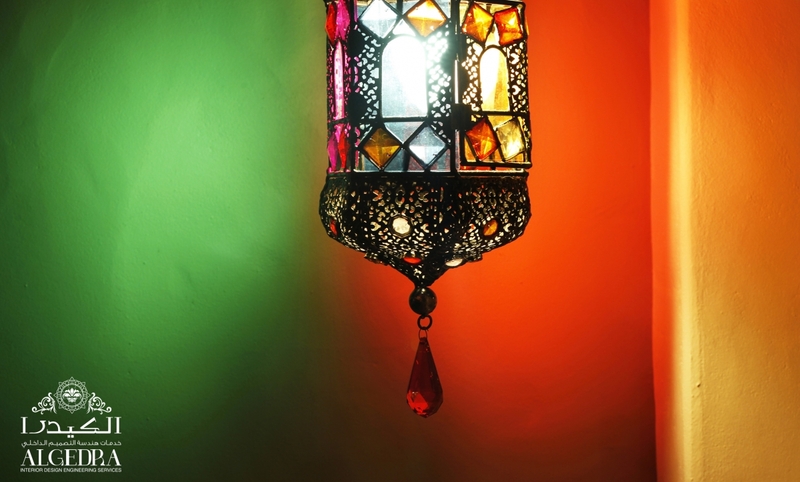 Lamps and Chandeliers are the very important decoration elements in the Arab Islamic style. They give a sense of Arabian nights in the lounge where the families, friends, guests, and visitors are seated. The addition of some dim lights in the corners of your sitting area or on the columns leading to the sitting can add up additional luxury to the home. Carpets with Islamic inscriptions are considered to be the most famous carpets in the world. They feature exquisite designs, details accuracy, the originality of patterns and the harmonious colors. Carpet is the basic piece in the Islamic style and while choosing it for the room, we should consider the other furniture as well in order to match it up with it. The color of the carpet especially should match the furniture and décor. Paying attention to the Arabic inscription details on a mirror frame and carved wooden cupboards and adding some accessories are very important in our guest hosting Arabic perception. It is just like the burner that reeks the smell of the incense and Arabian lute enhancing the Arab-style decor. You can also decorate it with two pillows on each side or a wall painting instead of the mirror. The Islamic style Arabian sitting feature a lot of wall paintings written in Arabic calligraphy of Koran verses and the names of the God (Allah). Some of them are the Arabic preaching, incarnations, and decorations on the walls of the sitting. There are many kinds from which you can choose and give your home’s sitting area an Arabian touch.